The Middletown Insider: Franklin Coffee Hours - Saturday April 22nd @ 9:00 a.m.
Franklin Coffee Hours - Saturday April 22nd @ 9:00 a.m. I will be holding Coffee Hours in Franklin on Saturday, April 22nd, from 9:00 a.m. - 10:00 a.m. at the Town Line Diner, 107 Route 32, Franklin. We will discuss the issues shaping the 2017 session, legislative initiatives you support or oppose, and any other topics that are of importance to you. 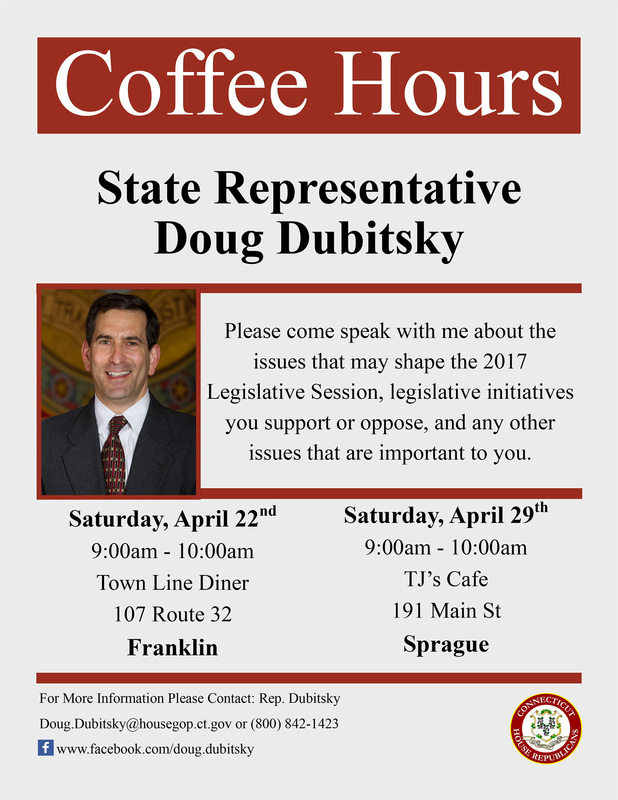 There will also be another Coffee Hours in Sprague on Saturday April 29th, from 9:00 a.m. - 10:00 a.m. at TJ’s Café, 191 Main Street, Sprague.